Since 1989, NOVA has been a reliable supplier for the industry's ingot, wafer, and cleanroom supplies. If you have a specific request, contact us today. >> Learn more about our products and services. NOVA is a leading provider of silicon wafer materials and processing services for the semiconductor industry. We offer one-stop shopping for a variety of products including silicon, glass, GaAs, GaP and other III-V material, as well as specialty materials such as Sapphire, SOI, Ge and Alumina. Our portfolio consists of wafers grown using standard Czochralski (CZ) method or float zone (FZ) recrystallization method in all diameters and specifications including prime, test, monitor and solar grade. 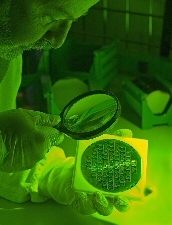 We also offer wafers with epitaxially grown films as well as silicon-on-insulator (SOI) wafers. With opportunities across the globe, NOVA strives to provide customers with the services they need, the quality they expect and the integrity they deserve. Our success is built on providing high quality silicon wafer products and services, together with extraordinary customer service. Quality: Our commitment to quality extends into every phase of our operation. Service: We provide immediate response to our customer’s needs. Reliability: Our eye for detail ensures on-time deliveries and order accuracy. Rely on NOVA for Quality People, Products and Services at Competitive Prices.